For all of you looking to have a romantic seaside wedding that's chic and rustic we have the perfect inspirational shoot for you. 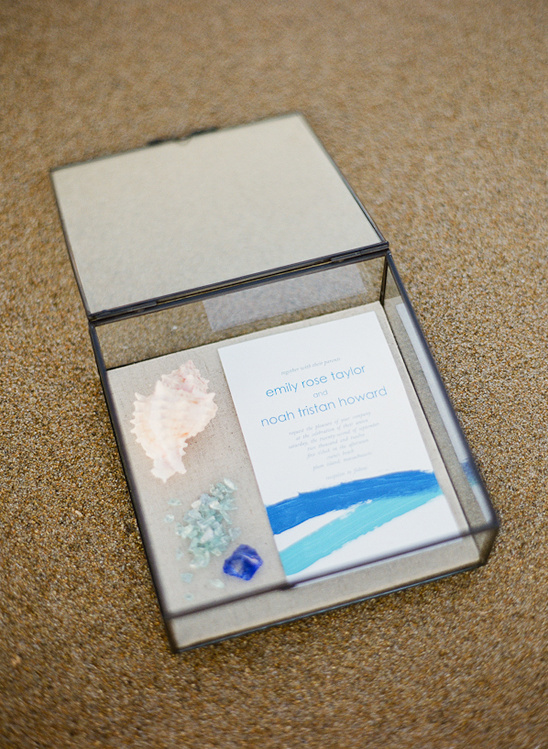 Dreamed up by Poppy Love Weddings and captured by one of our Hand-Picked wedding vendors White Loft Studio on the Plum Island Sound. Lucky for us, Poppy Love Weddings shares key ingredients to replicating something as dreamy as this for your own intimate beach wedding. To see more images perfect for pinning click here. The ceremony area was my favorite part of the set up. It was purposefully kept bare and simple - marked by a modern lucite console table with large rustic wicker spheres (also from West Elm). Here is where I incorporated the canvas flags and added the vintage style glass ring box, adorned with a sweet banner that read “love & cherish”. 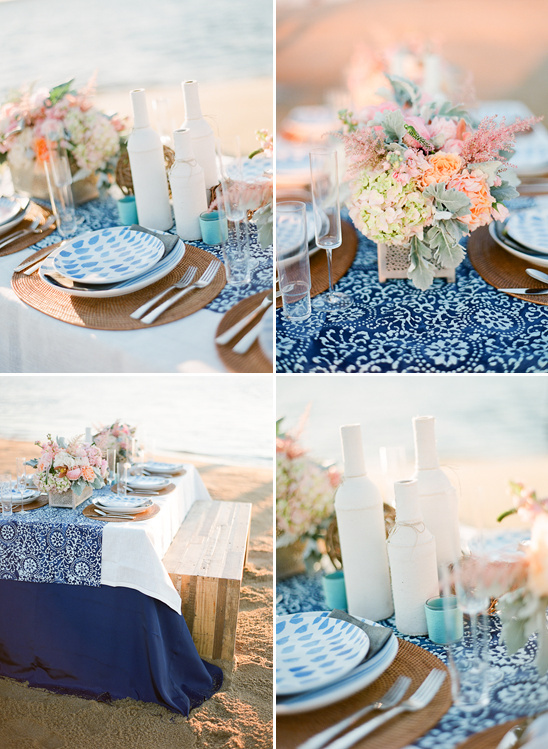 I wanted to create an inviting combination of beach rustic plus seaside elegance. 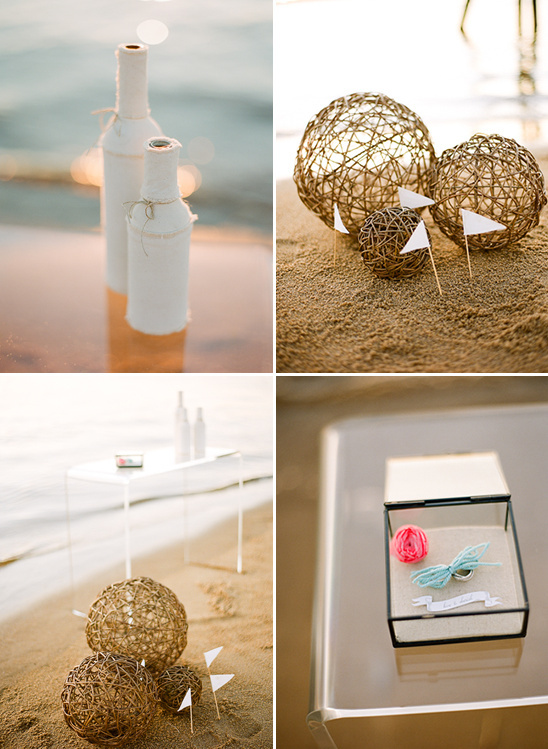 I brought in subtle boating elements, like the canvas covered wine bottles, petite canvas flags, and woven components like the wicker spheres. I used indigo as my anchor color and as soon as I laid eyes upon the David Stark Brush Stroke dinnerware at West Elm, I knew it was the perfect fit. 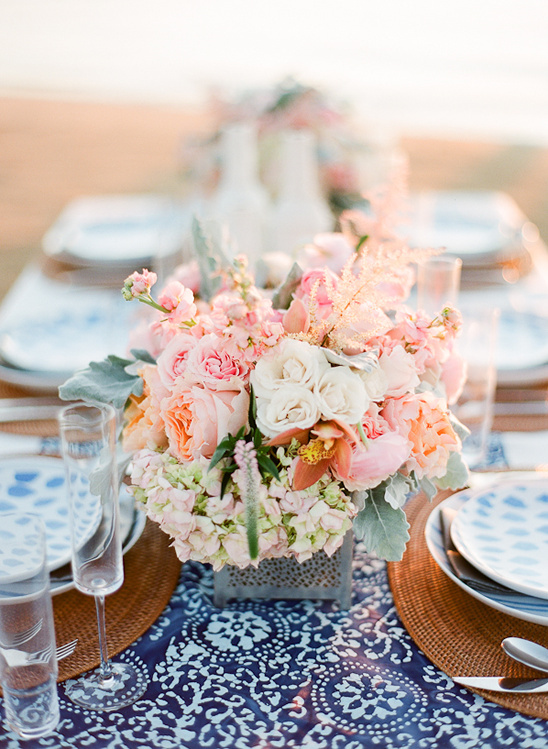 To soften the look, I incorporated soft romantic blooms in a *quiet riot* of pink and peach hues set into perforated metal containers for the floral centerpieces. 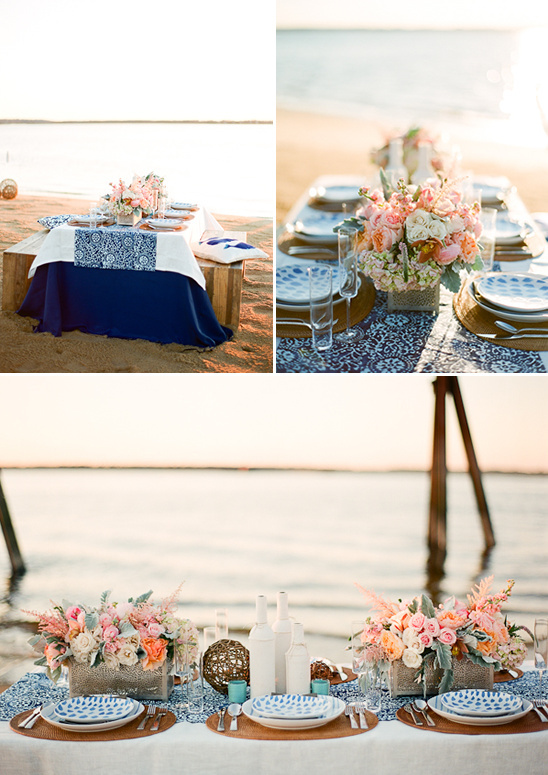 I layered fabrics, included driftwood-type bench seating, and added comfy nautical print pillows. A key ingredient of my design aesthetic is the mixture of high and low pieces. Because I focused most of my budget dollars on the impact of the place settings, I had to get creative with the other tabletop details. I found the batik print table runner in the half-off section of the Jo-Ann fabric store and was able to scoop it up for peanuts. Of course a trip to the craft store was in order, where I grabbed a few small wicker balls from the floral department and was inspired by the all the color and texture in the knitting department. I carried the pale aqua blue yarn detail throughout the design - wrapping simple glass votive holders with it along with tying the wedding bands together and it even made for the prettiest of bouquet wraps in lieu of ribbon! The cake was dreamt up by Heidi and beautifully executed by Hilary of Eat Cake!! 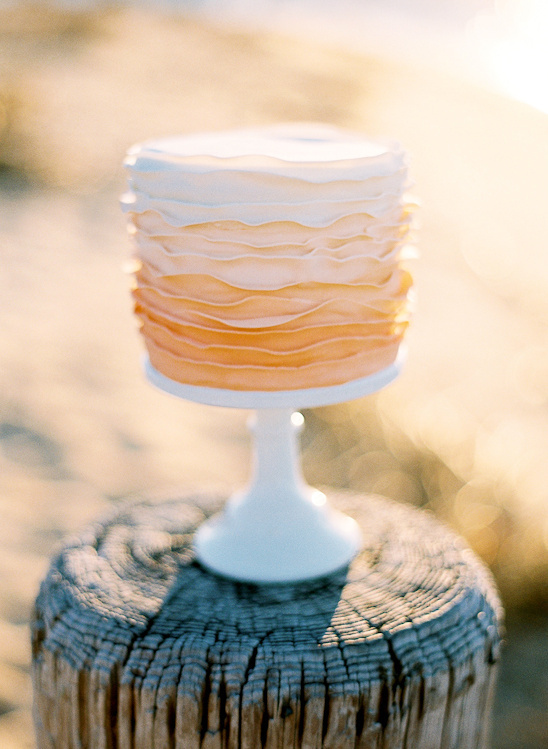 – a single-tiered cake of layered ombre ruffles. The complex yet airy ruffled design lends to the ethereal look of the day. - Seek out what you love, choose subtle elements that convey those feelings and repeat them throughout your décor. - Don’t be afraid to mix prints and textures. Dressing a table is like putting an outfit together; excessive matching is always tres boring! 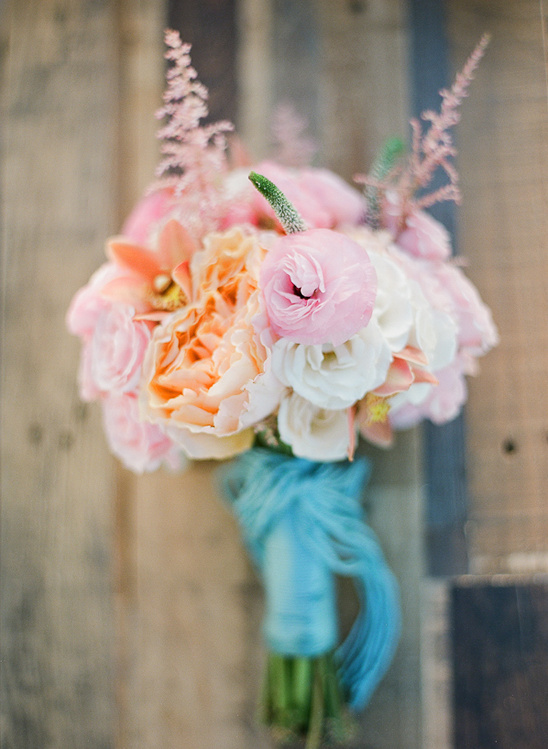 -When meeting with your floral designer, focus your efforts in conveying your color and shape preferences. Becoming too specific with exact blooms and shades can hinder the designer and the completed design. - Forget perfection! Instead aim for authenticity - there’s nothing worse then an over-produced event that over shadows the true meaning of the day. White Loft Studio is one of our exclusive The Hand-Picked Vendors. Hand-Picked Vendors are at the top of their game and provide excellent services! These vendors are chosen because of their commitment to excellence, stylish and fresh ideas, and their overall fresh approach to weddings. To learn more about how our Hand-Picked Vendors are chosen please click here.